Dr. Paul Finger has been named one of America’s top doctors in 2017. This marks the 10th straight year Dr. Finger has received this honor. Dr. Finger was also named among Castle Connolly’s Top Doctors for Cancer in 2017. He has earned inclusion in this list every year since its inception in 2006. For the 15th straight year, Dr. Finger was named a Top Doctor in the New York metro area. When it comes to your children’s health, trust your instincts! The persistence of an Oklahoma mother likely saved her daughter’s life. When Kourtney Norton noticed her daughter McKinley was walking sideways, she knew something wasn’t right. So, Kourtney took McKinley to her pediatrician. He mistakenly thought the little girl had an eye infection. When McKinley continued exhibiting strange symptoms, Kourtney took things to the next level. Kourtney felt certain something more than an eye infection was causing her daughter’s symptoms. With some persistence, she got her daughter referred to an eye specialist. That led to an Oklahoma cancer center where doctors discovered a large intraocular tumor. It had already caused blindness in McKinley’s left eye and extended into her optic nerve. Ultimately, Kourtney was diagnosed with retinoblastoma. Doctor’s had to remove McKinley’s eye. She is now undergoing chemotherapy, but she is likely to survive, thanks to her mom’s persistence. Retinoblastoma is the most common intraocular childhood cancer. Each year it affects approximately 300 children in the United States and 8,000 worldwide. In the USA, it is usually detected early, and the cure rate is high. But in the developing world the diagnosis is often delayed, resulting in the loss of one or both eyes, and even death. There is a hereditary link in about 40% of cases. The risk factors for sporadic retinoblastoma remain largely unknown. Like the McKinley’s, parents need to be aware of retinoblastoma signs and symptoms. A white spot in the pupil appearing when light shines into the eye is the most common sign. This often shows up in flash photography. Other symptoms include a lazy eye, vision problems, redness in the white part of the eye, bulging eyes, changes in the color of the iris, and unequally reactive pupils. Early screening is also important to detect cancer in its beginning stages. You should make sure your pediatrician regularly examines your child’s eyes. Most importantly, be persistent if you think something is wrong. 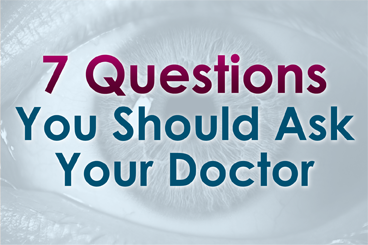 If you aren’t satisfied with what your doctor tells you, get a second opinion. You know your children better than anybody. Trust your instincts and be persistent. As the saying goes, it’s better to be safe than sorry. If you are interested in helping spread awareness of retinoblastoma symptoms, click here for more information.